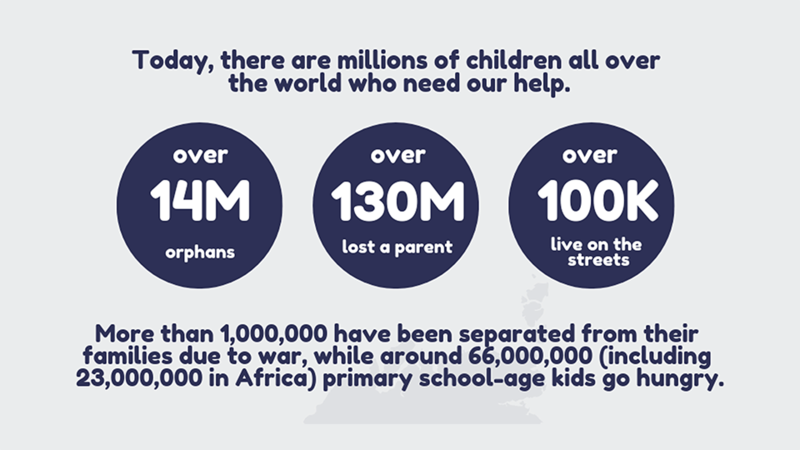 Today, there are millions of children all over the world who need our help. Over 14,000,000 kids are orphans and over 130,000,000 have lost at least one parent. Around 100,000 children live on the streets. About 2,300,000 have HIV/AIDS, more than 1,000,000 have been separated from their families due to war, and approximately 93,000,000 cannot attend school. 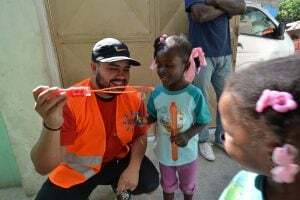 It is imperative that relief is o ered to these vulnerable kids in a time where they need all the support they can get. By donating to orphanages, children’s funds, and other charitable organizations, we can build a better future for children everywhere. Embrace Relief is dedicated to providing assistance to those who need it most. Join us in one of our many projects to help us bring hope to kids across the globe! We work with orphanages in regions to aid children who have lost their parents by providing food, shelter, and education. Around 66,000,000 (including 23,000,000 in Africa) primary school-age kids go hungry, which can cause growth stunting, underweight issues and other de ciencies. Keeping these children fed is a top priority. Without shelter, children lack the protection they need to survive from the elements, violence, and other hazards. We need to make sure that every child has a roof over his or her head. Education is an essential part of creating sustainable living conditions for children. Studies nd that it is just as important as food, shelter, and water. By educating these young minds, we can ensure that they can grow up with the knowledge they need for happy lives. Our mission is to give children in need the resources so they no longer have to live in fear.